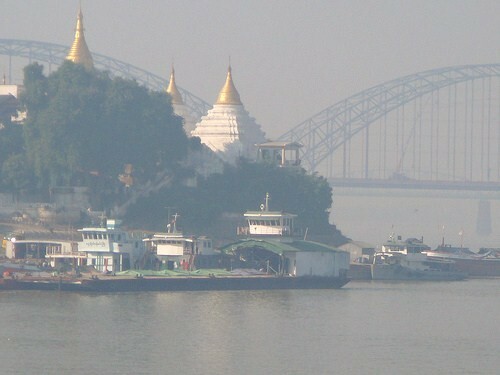 A magical morning as we sail into Mandalay. We sail under two iron bridges with hills on either side, full of golden stuppas that glisten in the early morning sun. Small fishing boats with one solid bright coloured sail, emerge slowly out of the mists and smoke that rise off the land and drift across the wide river. Ships carrying huge piles of rice chug along the river and are laden to the point where it seems that they would sink if you loaded one more sack on board. The ships are as old and dilapidated as the buses from the 1940’s, and their crews aren’t much better. They are all in dirty white T shirts and ragged longyis, and they wave as we go by. It is exactly as we imagined it as kids in school, reading Rudyard Kipling and learning about the glory days of the British Empire. 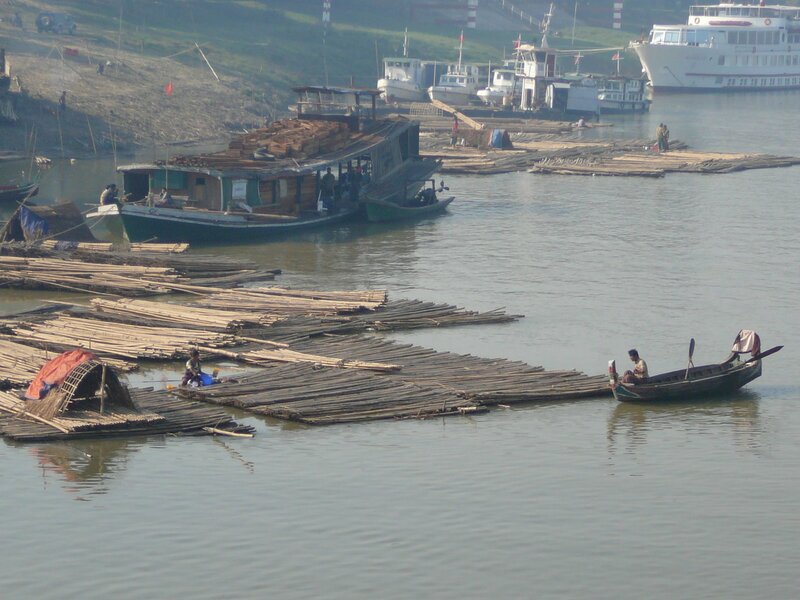 Once ashore we are met by our new guide, Min, a woman of about 40 suffering from a severe case of flu. It seems that half the country is in the grips of flu.. A Boy named Sue had it, but not badly, his driver had it, the two other passengers on the ship had it, two of the crew had it, and it is obvious that many people we see have it. But no one has seemed as sick as Min, who we are sure will not make it through the day. She is dressed for winter, with a rather strange hand knitted pink wool hat pulled down to her eyebrows, and a matching scarf wrapped twice round her neck and mouth. She has a huge padded coat which she holds tightly around her body, boots and a pair of gloves. The only part of her body exposed to the elements is her eyes. Where she found this clothing is a mystery, Mandalay is always hot and we never saw a shop selling anything like these clothes. She had to blow her nose constantly, which unfortunately she did directly into her hand, and then wiped her hand with a piece of toilet paper. This was not appealing. Both she and her husband are tour guides, and have two children. Because of the lack of tourists they were in dire straits and she has to work, no matter how sick she feels. She is only able to talk in a whisper because of her sore throat, and has to stop often to cough. We are reluctant to deprive her of the little income we are bringing her, so we control our impulse to tell her to go home. This entry was posted in Burma, Irrawaddy River, local transportation, Mandalay, Myanmar, Stuppas, travel guide, travel review, travel tips, travelogue. Bookmark the permalink.